Click or Call for a Complimentary Consultation! We all know the importance of first impressions. Even if your trees, shrubs and garden are thriving, a poor-looking lawn can drag down the appearance of your whole landscape! However, don't despair, in some cases, you can renovate or repair your lawn without taking the drastic plunge of sodding the whole thing or tilling and starting over. Lawn areas that receive heavy traffic or are used as a playground get pounded, and that means the soil get compacted. When the soil is compacted, grass plants struggle. The best way to remedy soil compaction is a practice known as core aeration. In this process, little cores of soil are removed from the ground to allow water and air into the ground to help grass roots compete with weeds that thrive in compacted earth. Any area of your lawn that receives a moderate amount of traffic should be core aerated annually. If the soil is extremely compacted, you may need to have your lawn aerated twice in one year. 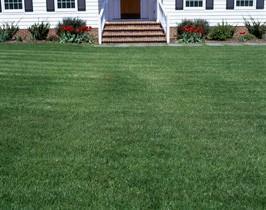 Once your lawn has been aerated, it is a good idea to overseed the area with pest resistant grasses. These grasses are known as endophyte-enhanced grasses, which means that they contain fungi that produce toxins that kill many grass-eating insects. Initially discovered because they made livestock (who consumed mass quantities) sick, endophytic grasses are obviously for lawns only, not for pasture. These cultivars not only escape damage of major pests such as chinch bugs, billbugs, and sod webworms, but also are more tolerant of cultural stresses such as drought. Therefore, your landscape will require less lawn care. If you prefer the look of more traditional grasses, choose from the many varieties which have been cultivated to be more tolerant of stress. This article is provided by SavATree of Wyckoff, NJ. SavATree is an environmentally sensible tree service and lawn care company accredited by the Tree Care Industry Association. Certified arborists provide expert analysis, recommendations, and services to help customers maximize the health, beauty, safety and value of their landscapes. SavATree services include tree pruning, tree fertilizer, insect control treatments, tree disease diagnosis, organic lawn care, green program options and more. © Copyright 2007 SavATree. All rights reserved. TIP #1- By fertilizing your lawn this fall, you will be making an investment in your lawn's root system that will reap considerable returns. Two or three applications of lawn fertilizer between September and December will provide your lawn with the nutrients that it needs to develop a deep, strong root system. This will enhance your lawn's ability to draw water from the soil so that it survives the winter and thrives next spring. Tip #2 - Aeration is a key practice that will help you maintain a thicker, more competitive lawn which in the end reduces weeds and keeps your lawn greener. It is a process of removing soil cores from your lawn to help improve water and air movement in the soil. The improved air and water movement aids in strengthening your lawn's root system and reduces compaction. Aeration also reduces thatch (that layer of organic material beneath your grass blades but above the soil level) by encouraging microorganism activity that decomposes thatch. The best time to aerate is in the fall. However, aeration will provide maximum benefit to your lawn if it is performed again in the spring. Lawns with thatch build up over 1/2 inch or compacted soil (from pets, people, lawn mower traffic or just heavy clay soils) should be aerated in fall and spring. Tip #3 - Clean up & mow. Keeping a lawn free of debris and mowing properly are critical elements of proper lawn care, especially going into the winter. To prepare your lawn for winter, rake up leaves no more than two weeks after they fall to prevent stress from suffocation and lack of light. Waiting to clean up all the leaves at one time can result in damage to your lawn which results in dead spots that will require seeding the following spring. 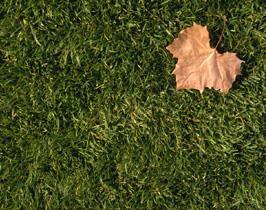 Once all of your leaves are cleaned up, you should mow the lawn one final time after it stops growing. This final mowing can be at a reduced mowing height of 2 to 2-1/2 inches. Tip #4 - Seeding should be done if your lawn is thin or if you wish to sow in new grasses due to poor color or diseases and is most effective when performed in the fall. The second best time to seed is in the spring as soon as you are able to get out between the spring rain storms to properly prepare the soil and seed the bare areas. As with most projects, the preparation is the key to the success, and takes the most time. Proper seeding includes preparation of the soil, choosing high quality seeds selected for the specific needs of your lawn, and applying the right rate of seeds. Once the seeding is complete, water is the critical element. Keeping the seed moist at all times is vital to ensure that the seedlings develop. One day of dry conditions for a young seedling can result in death and the unraveling of all of your hard work in preparation for a better lawn. Green Up - Nothing sets the tone like a lush, green lawn! Begin early with a program of fertilizing, regular mowing and lots of water. Color Up - Flowering trees, overflowing planters and well-tended flower beds create visual interest and a sense that the property is loved. Lift Up - Pruning and thinning of overgrown shrubs and ornamentals accentuates the visual interest of your home by creating balance between plants and buildings. Proper tree pruning will reveal your house and produce a landscape “frames” it beautifully. Keeping foundation shrubs away from windows improves the view too. Check Up - Examining trees for hazardous limbs can prevent serious injury to people and property. Dead branches, as well as those that are too close to the house or impede sidewalks, should be removed. Clean Up - Removing dead trees, shrubs, fallen branches and remaining tree stumps improves the appearance of the property and removes nesting grounds for mosquitoes and deer ticks. Step 2: Inventory existing trees and identify the ones with the highest aesthetic, economic and sentimental value. Step 3: Review the site plan. Schedule a meeting that includes the architect, landscape designer, and arborist. Determine which trees and shrubs can realistically be preserved, and which can be transplanted. Step 4: Design and implement a program to improve and maintain the health and structure of the trees and shrubs you want to preserve. 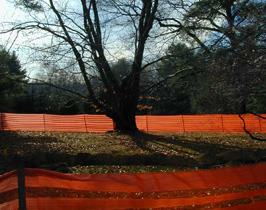 Step 5: Establish tree root zones to keep construction activity away from trees and minimize site work impact. Use special fencing to protect these zones. Step 6: Review moisture management option and soil compaction issues. Implement the appropriate remediation and prevention methods. Step 7: Monitor your trees response to site activity and treatments. Step 8: Once your project is complete, review the new landscape. Identify new plant material and any differences from your original plan. Make sure your maintenance program is revised to accommodate these changes in order to maintain the health and value of your landscape without bloating your budget. Whether it’s new home construction or an extensive renovation, minimizing the impact on the surrounding landscape takes careful planning and commitment from the homeowner, arborist and contractors working at the site. Experienced builders are becoming increasingly sensitive to the value in preserving the natural beauty of a home site. Many have perfected methods to minimize construction damage to trees, shrubs and other plants. As with most significant changes in industry, the move towards preserving natural beauty during construction is consumer driven. Most homeowners are very much aware of the positive effect that mature trees and shady areas have on their quality of life . . . not to mention property values. It’s a good idea to get some assistance evaluating the health, safety and relative value of trees and shrubs on you property. In new housing, buyers are increasingly requesting that their homes be positioned to take advantage of rock outcroppings & mature tree specimens. They are disenchanted with developments that offer dozens of homes scattered on a barren landscape, with just a couple of forlorn trees left standing strangely out of place. Again, enlist a tree service professional to help determine which trees are worthy to feature in your new landscape. It is no coincidence that home sites that border wooded areas are most sought after. 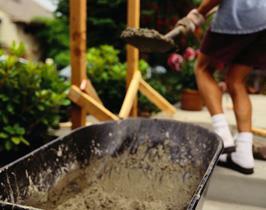 During renovations and foundation work, there are many landscape considerations. Often times, trees and shrubs are planted near a home when it is built and they grow to be a perfect compliment to the structure. When that structure is expanded, it takes a talented builder and committed homeowner to retain the services of an experienced tree mover for relocation of living specimens. Damage to trunk and leaf crown. Symptoms include small or off-color leaves, premature fall color, extensive water sprout development on the trunk and main limbs, dead twigs and eventually dead branches. Naturally, the best way to protect trees on a construction site is to prevent, or at least minimize any changes that may cause injury by consulting a tree service professional beforehand. Trees that have been injured are best treated by first stabilizing their environment. Next, deliver the appropriate amount of moisture and avoid additional stress factors caused by insects and disease with an accredited plant health care program. Follow up with maintenance pruning, cabling, bracing and the implementation of a nutrient program designed to recolonize the soil with beneficial mycorrhizae and provide the nutrients required for healthy growth. When homeowners and builders are committed to preserving natural beauty, they can work together to minimize the impact of construction and renovation, creating a home to be enjoyed both inside and out. Overview: SavATree has been providing customers in Bergen County NJ with the highest quality tree, shrub and lawn care for over 20 years. Industry certified arborists combine their knowledge, experience and environmentally sensible philosophy to help you enhance the health, beauty and safety of your landscape. Services: Safety audits, hazard reduction pruning, artistic & maintenance pruning, tree pruning, custom blend tree fertilization, insect and mite treatment, disease diagnosis, cabling & bracing, takedowns, 24-hour emergency service, organic & integrated lawn care, deer repellent, tick control and more!